A little known beauty of Istanbul: The German Fountain is located in Sultanahmet, right at the heart of Historical Peninsula. If you take rest for a moment from your tour in Sultanahmet Square, you are sure to notice the splendor of the German Fountain, together with its magnificent dome. This fountain has quenched the thirst of Istanbul residents throughout the last century, and also stands as a symbol of many important historical events from the 20th Century. The German Fountain was built by German Emperor Wilhelm the 2nd, and presented as a gift to Sultan Abdülhamid II. It was first unveiled at the beginning of 1901 with a lavish commemoration ceremony. In addition to being a magnificent gift, the German Fountain was also a symbol of the close relationship between the two empires, which would have significant ramifications on world history. This close relationship between Germany and the Ottoman Empire began in the beginning of the 1900s with the spread of German political influence to the east, and lasted up until the two nations’ alliance in World War I.
Spitta, Wilhelm the 2nd’s head architect, created the blueprint for the fountain, while other architects such as Schoele, Carlitzik and Joseph Antony also worked on its construction. Ultimately, its design deeply reflected the influence of the German Neo-Renaissance, while also resembling earlier Ottoman fountains. Undoubtedly, the fountain’s most interesting and magnificent aspect is its dome. This green dome is formed by a network of arches united to one another sitting atop eight pillars. 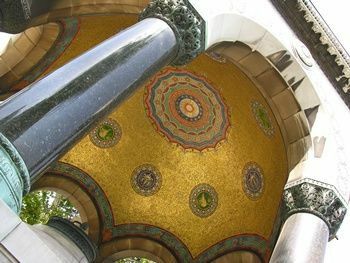 The interior of the dome is adorned with mosaics, which were painted with gold. The fountain, which is octagonal in design, rests on a high base. Colorful stones and geometric motifs were incorporated in its design for decoration, while its base was designed as a platform. Furthermore, the benches carved from marble were placed around the edges of the fountain. The German Fountain is located in the most majestic spot in Sultanahmet Square. Not only does the fountain quench one’s thirst, its incredible design also provokes nostalgia for times now past.